Mr. Okpa is the principal of The OKPA Co, LLC, and has been appraising commercial real estate and consulting on international trade for many years. Was the first person to head appraisal function for the Federal Deposit Insurance Corporation as Receiver for its central region [eight states] from the late 1980s to mid 1990. In addition to his business experience, community service includes 2nd Vice Chair of the Board of the Dallas Black Chamber of Commerce; Chair, International Trade and Relations;Chair, Business and Economic Development Committee. Until March 2003, was Mayor Kirk’s appointee to the City of Dallas Permit and License Appeal Board and served on the Census 2000 Complete Count Committee. Served on the Dallas County Appraisal Review Board and is currently on the Texas Board of the US Selective Service Systems under Region II, as a permanent board member. Dallas Mayor Hon. Laura Miller appointed Mr. Okpa to Chair the Martin Luther King Jr. Community Center in 2004. Graduate of Dallas Police Citizen’s Academy Class 17 in 1999 and Alumni of Dallas FBI CItizens Academy 2003. Director, World Affairs Council of Greater Dallas, participated in Dallas Business Journal Roundtable on ‘Branding the Metroplex’; June 2001. 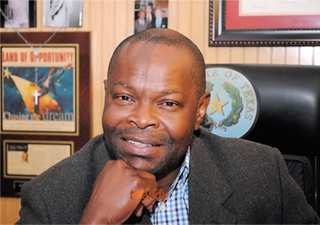 Mr. Okpa was a candidate for City of Dallas Mayor in May 2003 General Election. He traveled to several countries with Mayor Kirk on trade mission, including visit to Washington DC with Mayor Kirk to invite Ambassadors to the 20th Anniversary of Dallas Ambassadors Forum. In November 2004, Okpa was appointed to serve on City of Dallas Comprehensive Planning Advisory Committee as a representative of the chamber of commerce. Mr. Okpa is the principal of The OKPA Co, LLC, and has been appraising commercial real estate and consulting on international trade for many years.